Participating in a farmer’s market is a great income opportunity that allows you to connect with the people in your community. The only problem is that sometimes it seems like everyone is growing—and selling—the same things. If you are looking for something interesting to sell next to your tomatoes and kale, here are five things you can grow that are not only delicious and nutritious, but will help your table stand out from the others. A basket filled with artichokes is really unusual to see at farmer’s markets. This is probably because there is a misconception that they are difficult to grow. Not only are they easy to grow, they are a perennial that propagates by shooting up suckers. Artichokes – You can grow artichokes by planting dormant root divisions or by seed. Seed-grown artichokes mature faster, so if you live in an area with a short growing season, seeds are probably the best choice. Before sowing seeds, refrigerate them in damp peat moss for two weeks. This will help promote germination. Plant them 1/2” deep in 4” pots six to eight weeks before the last frost. Place in a warm, sunny window and keep the soil moist but not soggy. While your seeds are popping, prepare the artichoke bed in a sunny location. Double dig the bed, adding in compost which will help with fast growth and tender buds. Plant roots 4” deep and make sure the seedlings are planted at the level at which they grew in the pot. Space them 4-6′ apart. Keep the soil moist, cool, and weed-free. This is most easily accomplished by mulching. Artichokes will overwinter successfully in zones 7 and 8 if you strip off all the dead leaves and pile leaves over the plants to cover. Top the leaves with a layer of soil. Uncover as soon as the ground has thawed in the spring. If you live in a colder area you can dig up the roots, brush off the soil and cut the stems 3” above the crown. Store the roots in breathable bags in a cool area that will not receive frost. Artichokes grow vigorously for three to seven years. You have access to new plants every three years. This is when you can cut the rooted suckers from the parent plant. Replant the suckers in another bed and water well. To harvest your artichokes, cut them before they open, when they are about the size of an orange, with 1” of stem. They are best if used quickly, but can be refrigerated for up to one month. Chayotes look a bit like bumpy pears. Chayote – Chayote is a warmth-loving, tender perennial. You can purchase the fruit at Latin markets and at most Wal-Mart grocery stores. 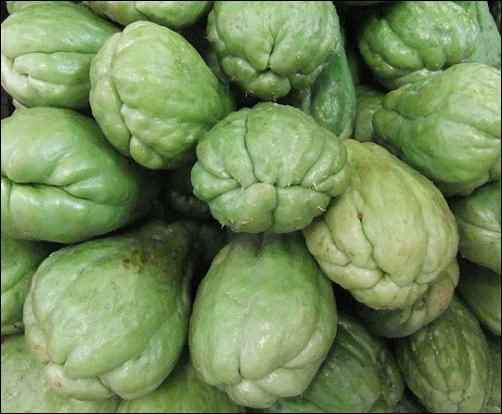 Chayote is an abundant producer. When deciding how much to plant, bear in mind that one plant produces enough for a family of four. Chayote needs 120-150 frost-free days, regular watering, and a sturdy support trellis to climb on. Plant a whole chayote fruit about 4-6” deep with the fat end down and at an angle so the smaller end is just level with the soil surface. If planting more than one vine, space the plants 10′ apart. In 120-150 days you will have a trellis full of the pale-green, flattened pear shaped fruits. They have a nutty flavor and can be prepared just as you would prepare fall squash. Harvest them with a sharp knife when the fruit is 4-6” in diameter, before the flesh gets hard. To protect your perennial, cut down vines and cover plant with a layer of mulch before the first freeze. To encourage customers to try this squash, set some jars of chayote pickles beside the fresh fruit. Combine vinegar, water, salt, and black pepper in a large sauce pot. Bring to a boil, stirring to blend. Distribute the chopped vegetables into the prepared jars. Cover vegetables with the hot liquid, leaving a 1/2” headspace. Remove air bubbles. Wipe rims and apply lids and rings finger-tight. Process in a boiling water bath for ten minutes. Remove from bath and let sit on the counter overnight. Refrigerate any jars that did not seal. Horseradish is the next alternative crop that is fun to take to a farmer’s market. It is another perennial, but it can be invasive so take care where you plant it. You need to start horseradish from root cuttings in rich and moist soil. The roots want to grow several feet deep so be sure to prepare the bed, removing any large rocks. Plant the root pieces in early spring with the small ends pointing down and the large ends 3” below soil level. Space them 1′ apart in rows that are 3′ apart. Water as needed, paying extra attention to watering during the late summer and fall. In October or November use your spading fork to dig up the roots. Any unharvested pieces will sprout again in the spring. Horseradish roots will create interest at your table but a lot of people will be unsure of what to do with it. Restaurants are usually the most interested in buying unprocessed horseradish. Set a few jars of pickled horseradish next to the fresh roots and people are sure to buy. Prepare four half-pint jars or eight four-ounce jars. In a saucepan combine the sugar, salt, and vinegar. Bring to a boil, stirring often, until the sugar and salt are dissolved. Add horseradish and return to a boil, pressing occasionally to submerge horseradish in the liquid. Remove from heat once horseradish is soft. Lettuces and herbs bring beauty and diversity to your booth. Pack into hot jars and cover with liquid, leaving 1/2” headspace. Remove air bubbles. Wipe rims and apply lids and rings finger-tight. Place jars in a water bath and bring water to a boil. Process in boiling water for ten minutes. Remove jars and set them on a dishtowel overnight. Check lids and refrigerate any that have not sealed properly. Lettuce – Lettuce is boring, you may say, but I beg to differ. The lettuce available at grocery stores is boring, and not very tasty, but growing your own lettuce will introduce you to some amazing varieties. The best thing about lettuce is that there are varieties for each season so you can sell your salad year-round. Lettuce is very easy to grow—there are no special tricks—so the key here is going to be how you present your lettuce to your customers. Lettuce seems to sell well when there are choices. The three that have worked well for me are heads of lettuce, bags of salad, and salad bowls. Heads of lettuce are what you get at the grocery store: whole head of lettuce. Different varieties lined up in a shallow pan of cold water look beautiful on the market table. 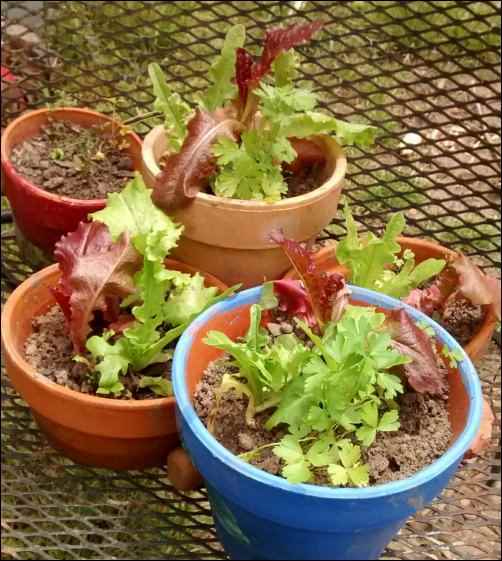 Directly underneath the display of heads of lettuce, have four or five lush potted salad greens that your customer can set on their porch and pick as needed. Also let them know you also have bags of prepared salad in the cooler. I sell half and full-pound bags of mixed salad greens, which not only includes leaf lettuce but Swiss chard, baby spinach, and fresh herbs. Succession planting is important to keep your lettuce sales up. Sow seeds appropriate to the season every one to two weeks. Shiitakes – There are steps to cultivating shiitakes, but if you follow them your chances of success are high. You can sell shiitakes by weight, and you can entice customers to your table by setting a small fruiting log in front of your booth. Shiitakes can bring great value to your garden. 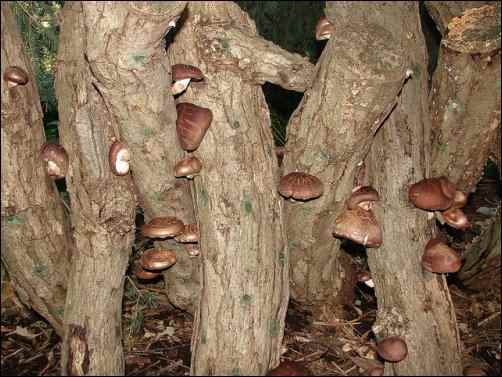 You can buy shiitake plugs from online shops such as Fungi Perfecti. While waiting for them to be delivered, select and prepare your wood. Shiitakes do well on a variety of deciduous wood but thick-barked hardwoods like oak are preferable. Other acceptable woods are sweetgum, ash, chestnut, ironwood, and hickory. Although logs can be cut at any time of the year, it is best to cut them in late winter or early spring just before buds sprout. This is when the sap and moisture content is the highest. Let the logs sit for two weeks before you inoculate them. Using a 5/16” drill bit, drill 1 1/4” deep holes in your logs. Space them no more than 4” apart in an evenly-spaced diamond pattern. Once the holes have been drilled, insert the spawn plugs. Place the plug into the first hole and gently tap it with a rubber mallet until the top of the plug is flush with the bark. Repeat. Do not leave any drilled holes empty. Once you have filled all of the holes, seal the log with a food grade wax. Melt the wax and apply to both ends of the log with a paintbrush. Incubate your logs by stacking them, slightly off the ground, in crisscrossed piles in a shady area. Water these logs once or twice every other week, for 5-10 minutes a stretch, until freezing temperatures or heavy rain begins. Now you just have to wait. In six to twelve months your logs will be fruiting shiitakes! Enjoy these farmer’s market products and stand out with fun and unusual produce. Be sure to include value-added products when you can and recipes for any produce your customers may not be familiar with. Seeds of Control: OMG it’s GMO!